Yew Tree Trout Fishery has been established for over 20 years and offers nymph and dry fly fishing of the highest quality. Set in 30 acres of fields and woodlands in the High Weald of Sussex, the Fishery provides fishermen with a quiet and secluded site in which to enjoy their sport. 6 acres of lakes are stocked with brownies and rainbows that have an average size of 1lb and 2 lb. respectively. The fishing is ideally suited to those anglers interested in imitative dry fly or nymph fishing, especially for the brown. Floating or intermediate lines with long leaders are best suited for these waters. Last season, the largest rainbow caught was 8 lbs. and the largest brownie was 5 lbs. Visit the website for current ticket prices. 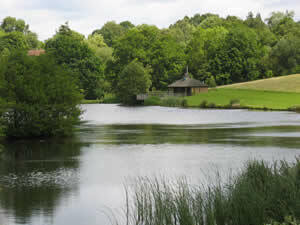 Two of the three lakes, which total 6 acres of water, are stocked with rainbow trout with a weight range of 1 ½ to 8 lbs. The third lake is stocked only with brownies. Our reputation has been built on stocking fish that are locally sourced and are of the highest quality. The Fishery Lodge consists of a clubroom (with a fridge and facilities for hot drinks), a weighing–in room and toilet. All have wheelchair access.